A student from Kings Cliffe has been selected as the Labour candidate to contest the Northamptonshire County Council Oundle by-election. 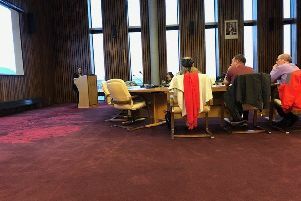 Harry James, 24, will stand in the rural ward that was vacated after former NCC leader Heather Smith resigned as a councillor on New Year’s Eve, saying her continued presence would serve no useful purpose on the council. Now her seat is up for grabs - in the midst of the proposed dissolution of NCC - and a by-election will be held on February 21. Harry is hoping to cut his political teeth in Oundle after several years helping Labour fight campaigns on the doorstep. The son of a chimney sweep and a child practitioner, Harry moved from the south of England to Woodnewton as a four-year-old and then to Kings Cliffe, where he still lives. “There was massive local opposition with people chaining themselves to the railings and all sorts. Former Prince William School pupil Harry is undertaking a BA Hons Open University degree in International Studies. He said: “In 2014 I was diagnosed with Aspergers and I experienced the state of the health services available in the area. “I had been talking to (former Labour MP) Andy Sawford and he had given offered me some support while I was seeking a diagnosis. “I always knew something was different - I could name all the capital cities in the world but didn’t know basic times tables. “My mum and dad were offered a parent workshop to help them understand more about the condition but it was in Glasgow! “Because of the difficulties I faced during that time, I became even more involved in local politics as I saw that it could really make a difference in people’s lives. Harry said that he believes former ward councillor Heather Smith, who resigned as NCC leader after an unprecedented period in the county’s political history, was given a raw deal by the county’s Conservative MPs, who said that local management was to blame for the near-bankruptcy of the authority. “She was thrown under the bus,” said Harry. The by-election will take place on February 21. The Liberal Democrats and the Conservative party have not yet formally announced the names of their candidates.